No, this is not a fleet of UFO’s lined up at SPEC Machine. 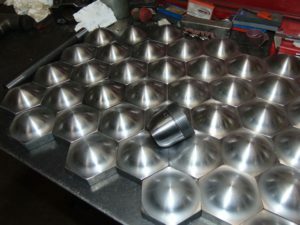 These are the caps for the latest batch of flexible staybolts being made for the 1385. 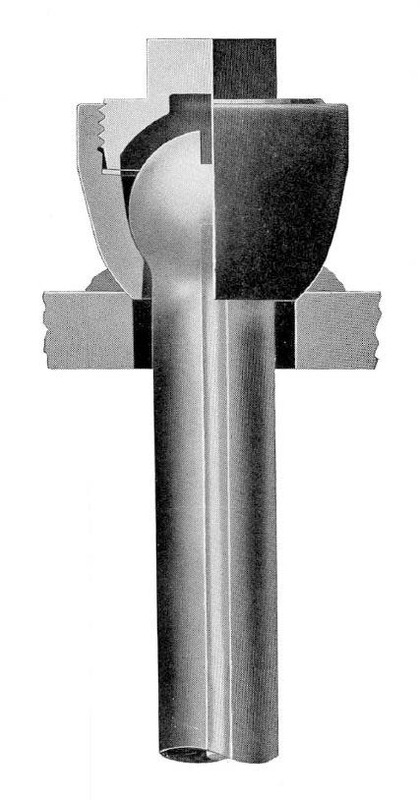 The caps and sleeves shown (above) and the staybolt itself is completed when a ball end (below left) is threaded onto the bolt and the bolt is placed into the sleeve (below right). Below is a comparison of the two types. You may wonder why we need 2 types of flexi’s. That is because we have to allow for support of curved as well as flat surfaces. 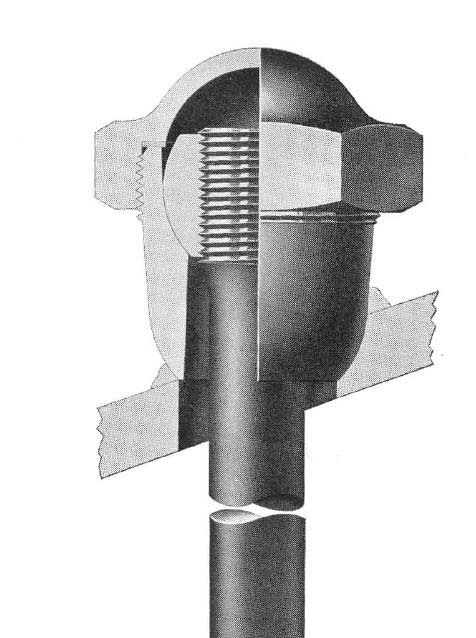 This illustration from the 1938 Flannery Staybolt Catalog shows how the first batch of staybolts will be applied. This is the UW style and is designed to be used where the staybolt will be going through the supported sheet at close to a right angle and the inside and outside sheets are very close to parallel. The flexible staybolts on the throat sheet at the front corners of the firebox will utilize the UW style. The latest batch is the WR style which is designed to be applied where the inside and outside sheets curve at different rates and do not run parallel. This is the situation near the top of the wrapper sheet and firebox. 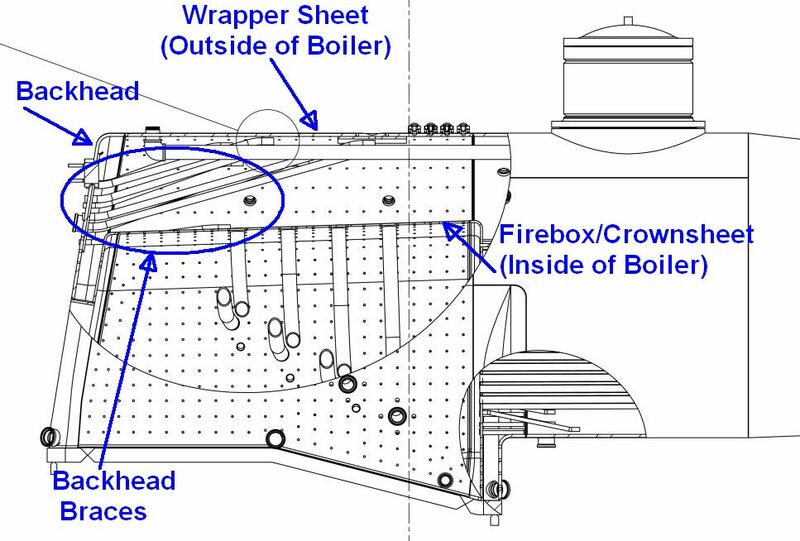 Because the top of the firebox (the crownsheet) is rolled in a tighter radius than the wrapper sheet and the rigid end of the staybolt needs to be square to the sheet it is attached to the flexible end goes through its’ sheet at some angle. UW style flexible staybolt. Illustration from 1938 Flannery Staybolt Catalog. WR style flexible staybolt. Illustration from 1938 Flannery Staybolt Catalog. All these parts are coming together and will be forming a boiler very soon. I took a quick trip with Steve & Tyler Roudebush of SPEC Machine to deliver a palette of parts to Continental Fabricating in St. Louis as well as inspect the progress on the new boiler for 1385. 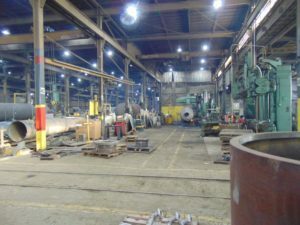 More photos and details about the boiler will be posted later but I wanted to share a few shots of Continental’s shop. I hope this will give folks a feel for the size of operation building our vessel. Continental keeps on hand over a million pounds of certified material stocks. A few pieces in process. This plate roller is designed to shape steel plates 6 inches thick. 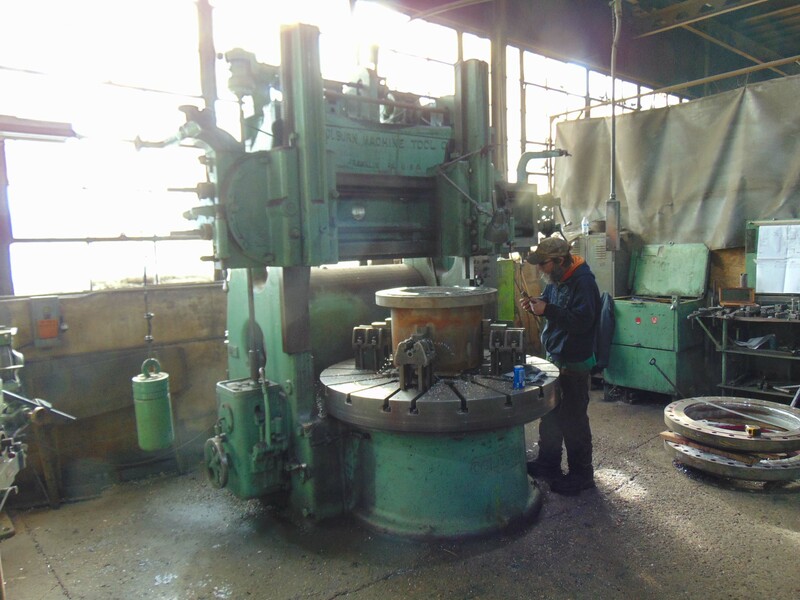 It will accept a flat plate and roll it into a round barrel shape. Radial arm drill. 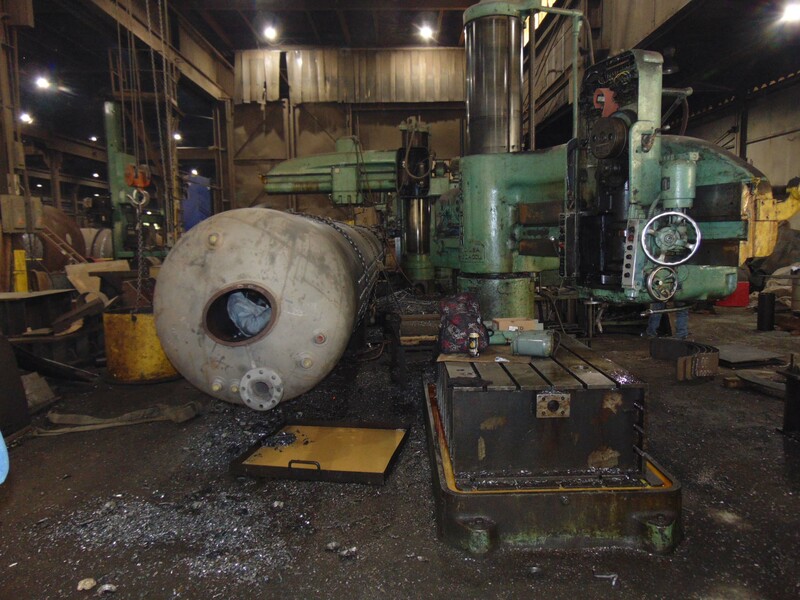 Look closely and you’ll see a worker inside the vessel that’s sitting on the radial arm drill. 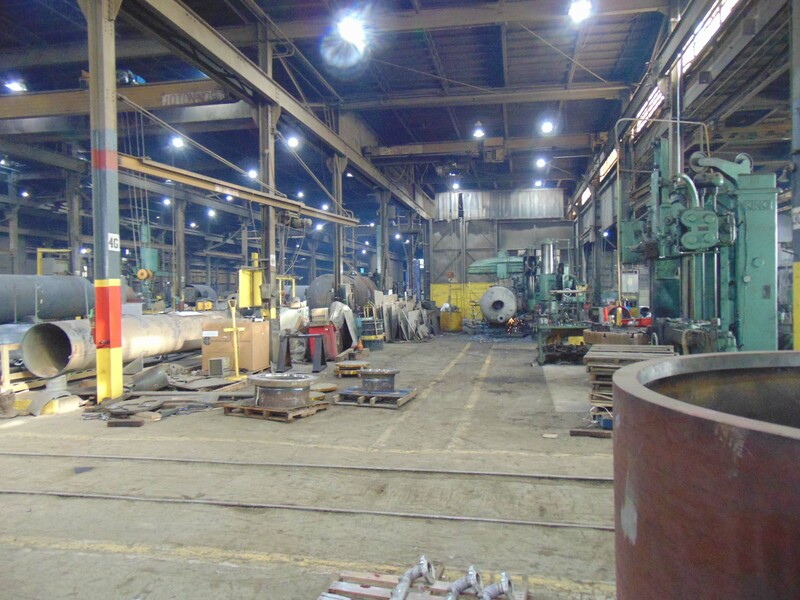 The 20 x 20 x 80 ft heat treat oven. Steve, Tyler of SPEC Machine and Tom G. of Continentral. Incoming material including the steam dome cover for the 1385. 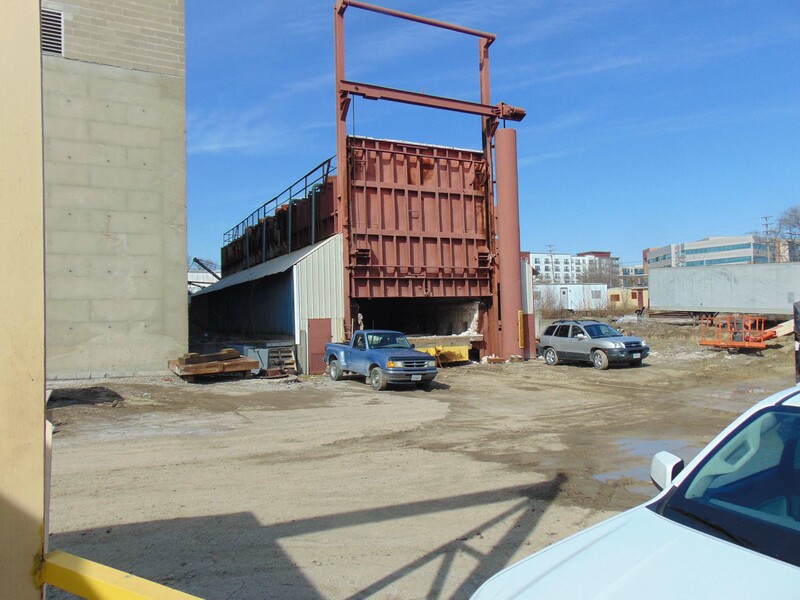 Also a small shear and press in the background. 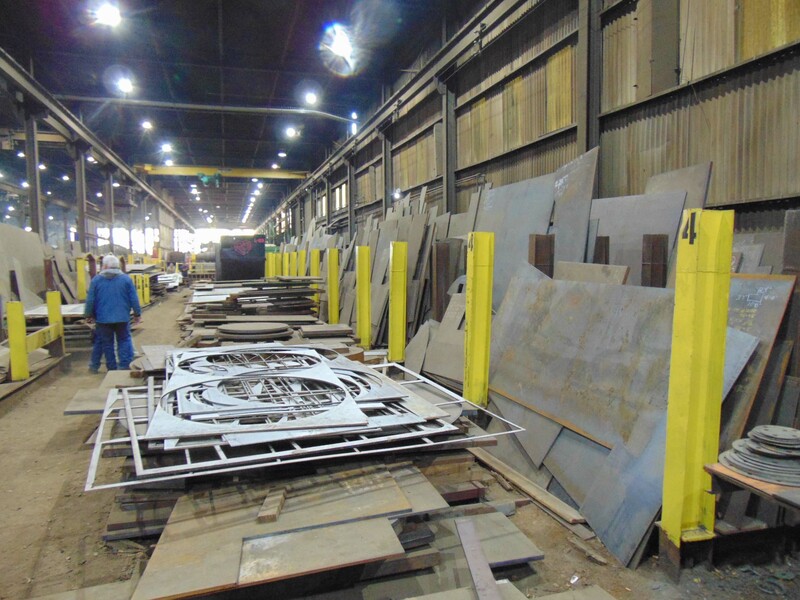 During the last week of January Continental Fabricators began installation of the 1385’s backhead diagonal braces. 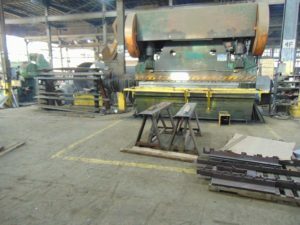 The backhead is the end of the boiler located within the cab and is a large, flat plate or sheet of steel that has been flanged and then welded to the wrapper sheet. 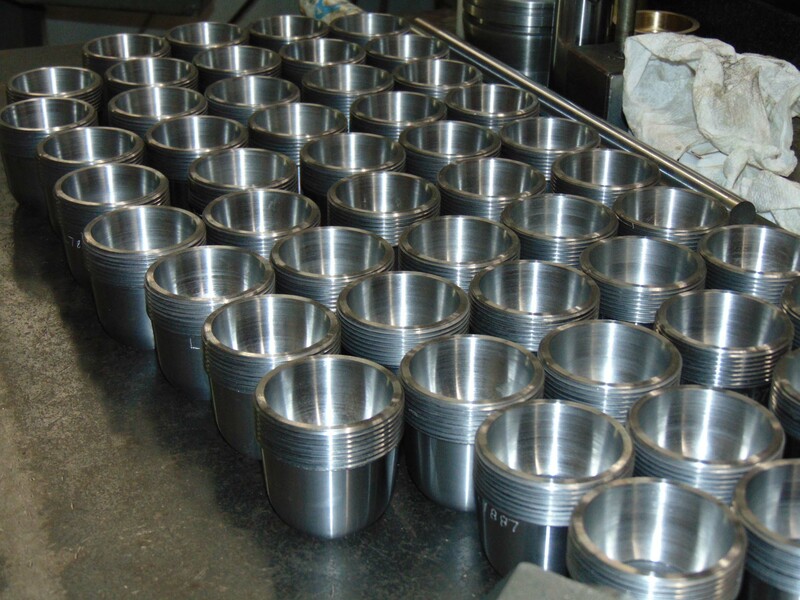 Flanging is the process of very carefully curling the edges of a sheet to meet the next piece it will be mated to. The flanging process has been covered in previous update posts. Much of the boiler is round, a naturally strong shape. With areas that are flat or nearly flat the forces of nature (including steam pressure) are constantly trying to force them round and thus they require support or “staying”. 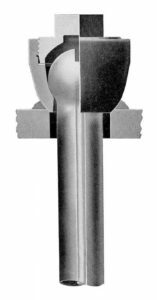 Staybolts, or “stays” and braces are thus used to reinforce the area and prevent the backhead as well as the other flat areas from bowing outward when the boiler is under pressure. While installing these braces, crews at Continental Fabricators flipped the wrapper sheet/backhead assembly upside-down to facilitate easier working conditions. 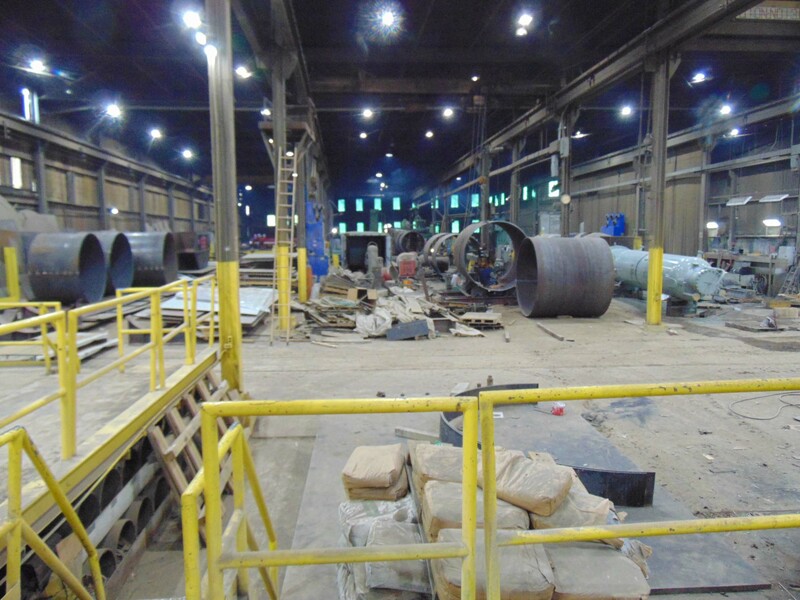 The first photo below shows the assembly as of the last week of January 2019 as the braces are being fitted and tack welded in place. 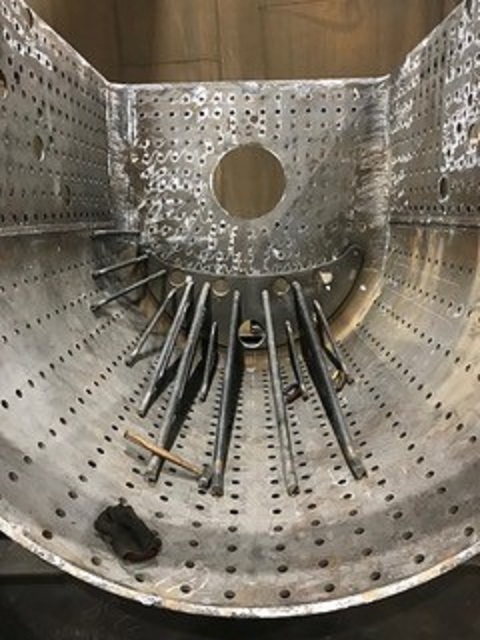 The tack welds are just enough to hold the braces in place so this assembly can be righted and lowered onto the firebox/mud ring assembly to check for proper clearance between the braces and the firebox. Once Continental is satisfied with the fit-up between the pieces the wrapper assembly will once again be pulled off the firebox, inverted and the braces will receive the final welds. 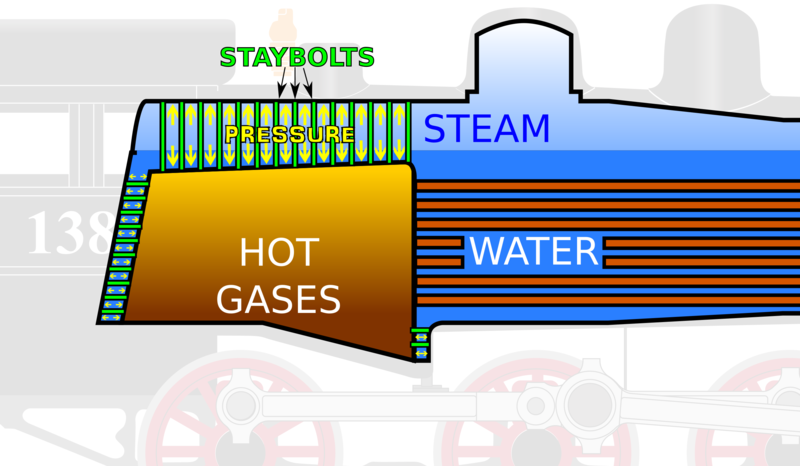 Much of the backhead will be supported via staybolts connected between it and the firebox door sheet. 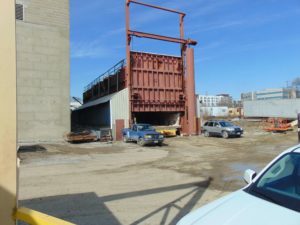 The pictured diagonal braces are used to support the part of the backhead that does not line up with the door sheet and is instead connected to the wrapper sheet for support. This picture was taken during the last week of Jan. 2019. Photo courtesy Continental Fabricators. A few days later during this the first full week of February, Continental’s crews had flipped the backhead/wrapper sheet assembly right-side-up again and placed it over top the firebox/mud ring assembly. 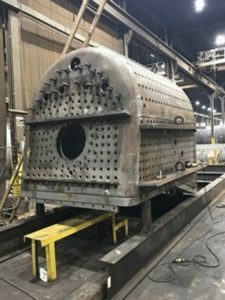 The purpose of doing this is to test fit for any contact between the backhead braces and the firebox crown sheet before final welding of the braces and before the wrapper sheet/backhead assembly is welded to the firebox/mud ring assembly. 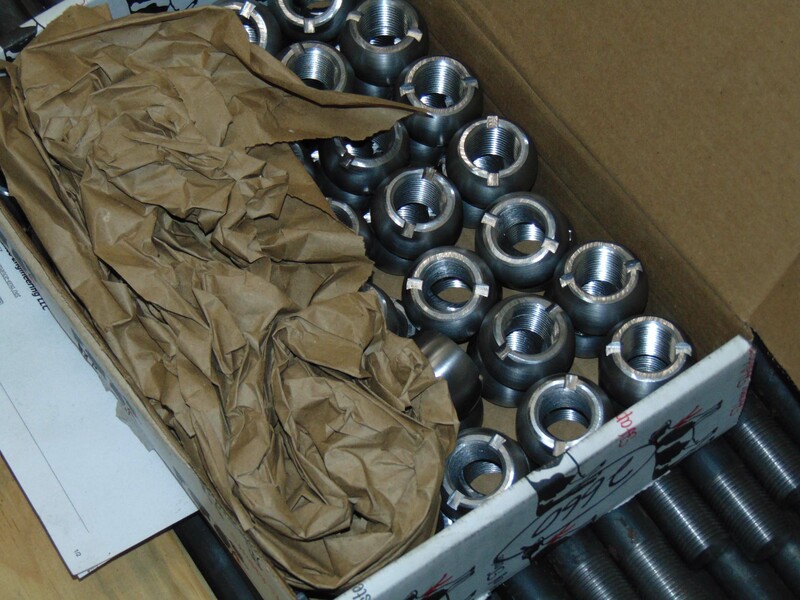 Once the two assemblies become one the installation of the staybolts can begin. Test fitting the wrapper for proper clearance before completing backhead stay installation. Photo courtesy Continental Fabricators. 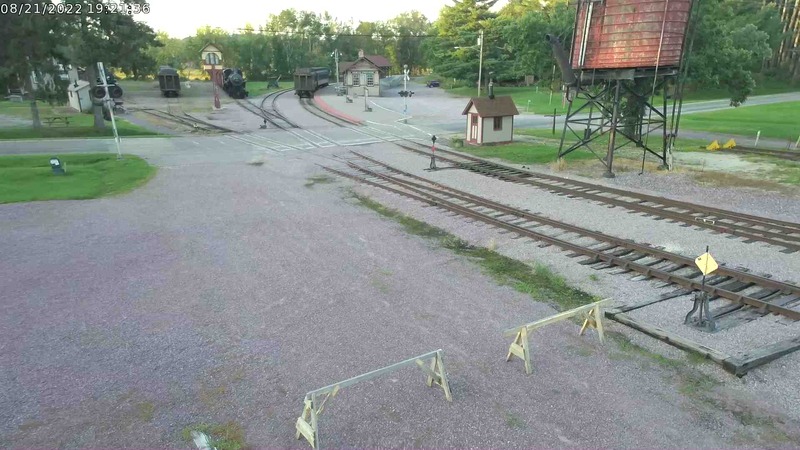 This photo was taken from the front of the firebox looking toward the backhead. It shows the steam/water space between the firebox/crownsheet and the wrapper sheet. Photo courtesy Continental Fabricators. 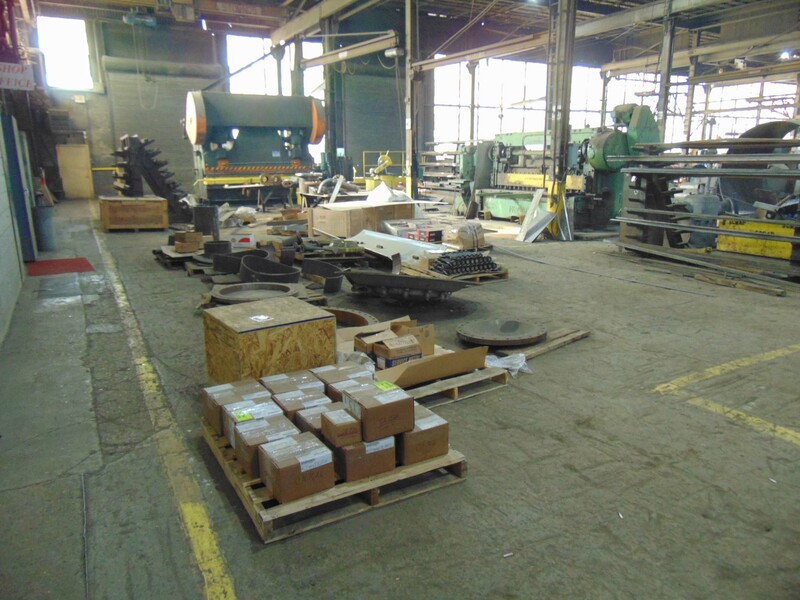 SPEC has received the stock to be used for C&NW No. 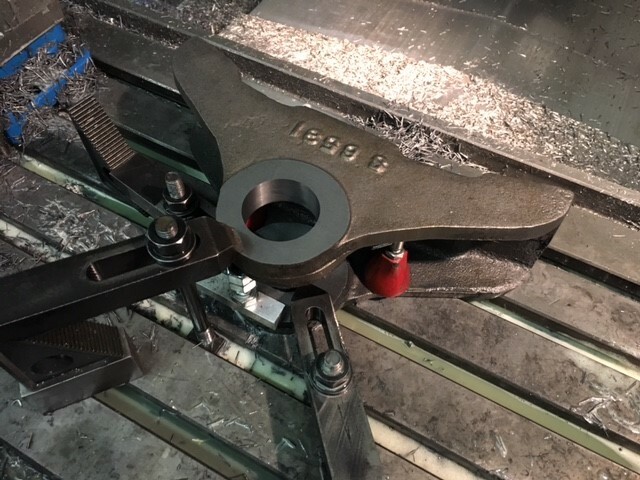 1385’s rigid staybolts and is cutting it to the length, engraving the heat number and drilling the tell-tale holes per Continental Fabricator’s specifications. 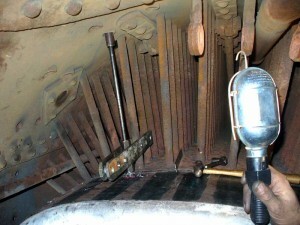 There will be over 1000 new rigid staybolts created in all, cut to five different lengths as required by 1385’s boiler. 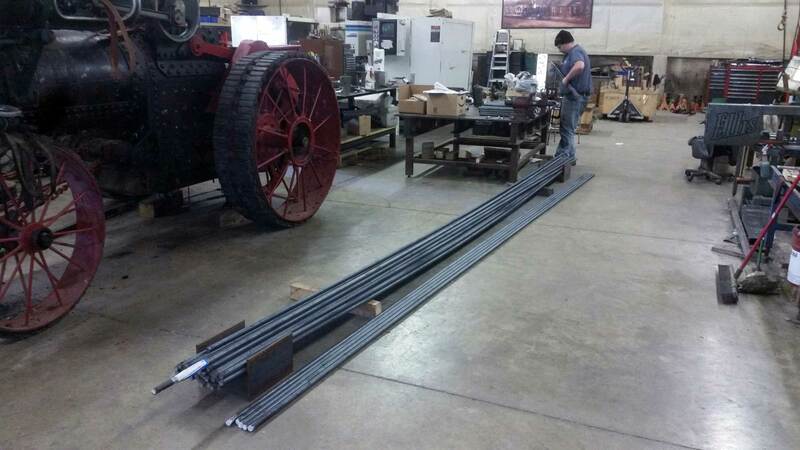 Stock is being cut to the proper length for producing 1385’s rigid staybolts. Ed Ripp photo. 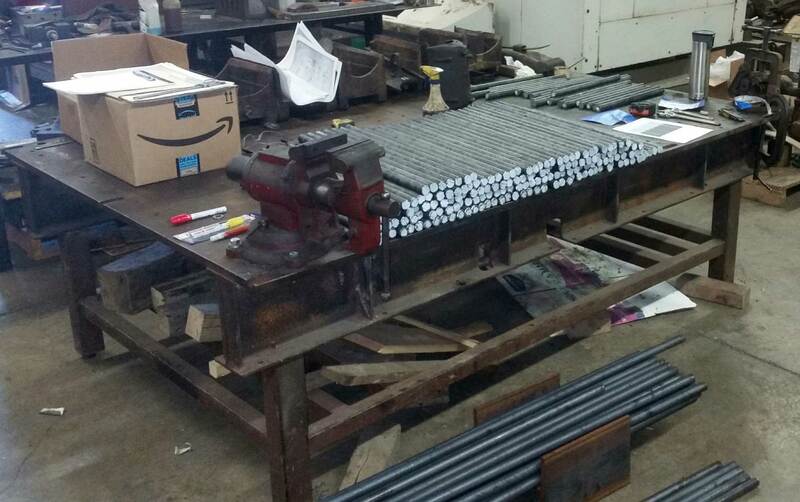 SPEC Machine employees work on cutting the stock to length as the first step of producing over 1000 rigid staybolts for C&NW 1385. Ed Ripp photo. The Flannery Bolt Company is long gone but their products live on as their staybolt and staybolt accessories are reproduced today for projects like the Mid-Continent’s Chicago & North Western No. 1385. In the steam era staybolt production and replacement were a regular occurrence and such parts were readily available in large quantities. 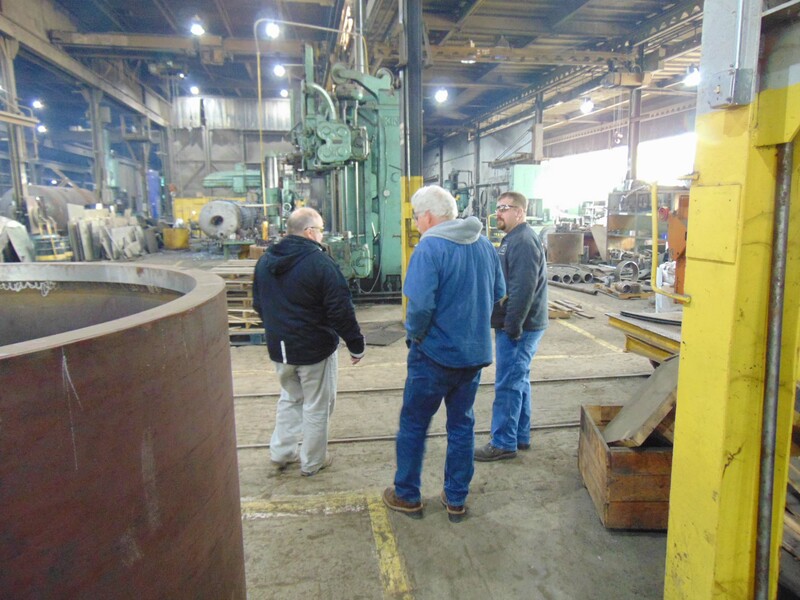 Even in 2018 there are at least two shops readily producing them as a specialty item, but for the 1385 project Mid-Continent has opted to keep it local, producing them in-house at SPEC Machine where the bulk of the locomotive’s overhaul and assembly is taking place. 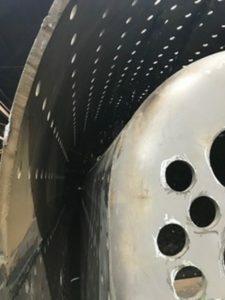 The majority of the boiler is cylindrical, a naturally strong shape, but there are also some flat and irregular surfaces within the boiler too, especially around the firebox. 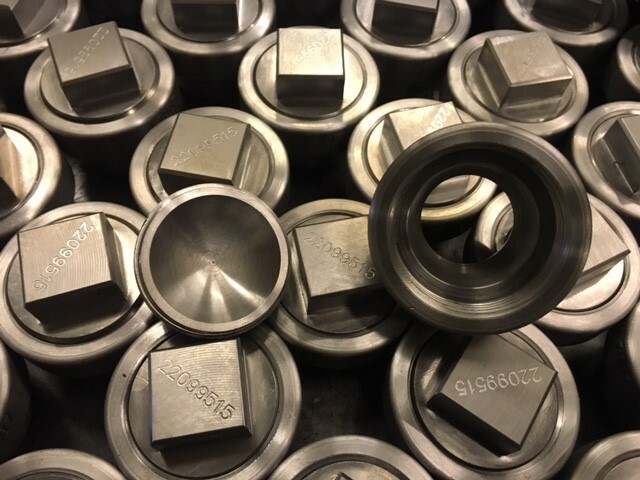 With the intense pressures up to 250 psi inside 1385’s boiler, these surfaces would weaken, bow, and eventually fail without staybolts to support them. A flexible staybolt has a ball shape on one end and is threaded on the other. 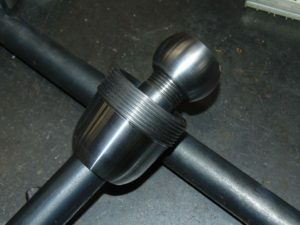 The ball end fits into and will be held by the cup shape of the inside of the sleeve. The sleeve will be welded on the outside or wrapper sheet of the boiler above the firebox. The bolt is then dropped into the sleeve and the threaded end is screwed into a threaded hole in the firebox. 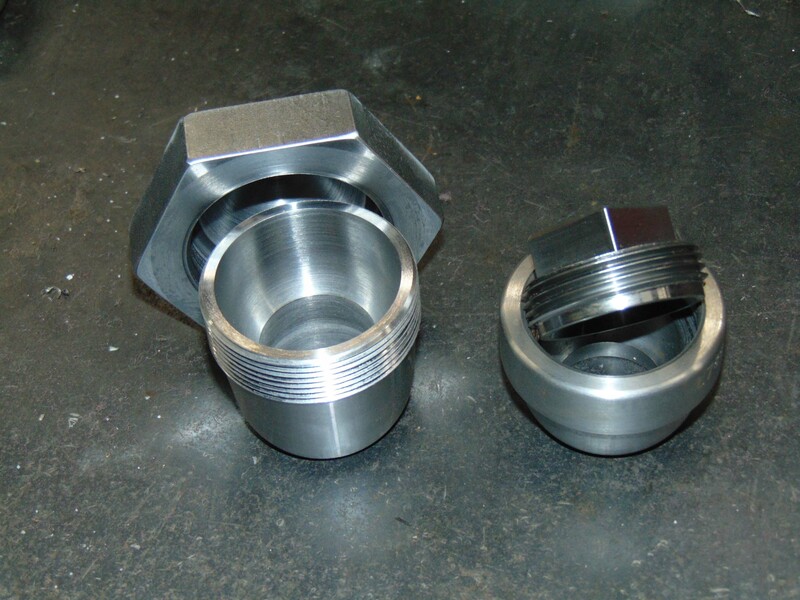 The bolt is hammered or “upset” to cause it to swell into the threads and form a steam tight seal and a copper gasket is applied with the cap to seal the sleeve end. The ball end of the bolt can actually swivel in the cup shape of the cap and it allows the firebox to move in relation to the wrapper sheet of the boiler as the engine goes down the road. [Locomotive designers] found that allowing that slight bit of movement was better overall for the boiler than trying to hold every bit very stiff and rigid. If things were too rigid the boiler would break the staybolts anyway. 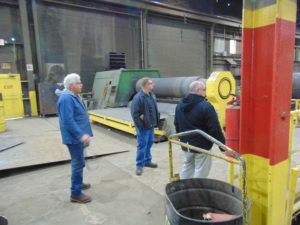 It was also noted there were fairly specific areas of a boiler that were prone to breaking stays so the Railroad Master Mechanics Committee came out with recommended patterns of placement for the flexi’s to alleviate or at least minimize the breakage. New flexible stay caps and sleeves were fabricated in January 2018 by SPEC Machine for C&NW 1385. 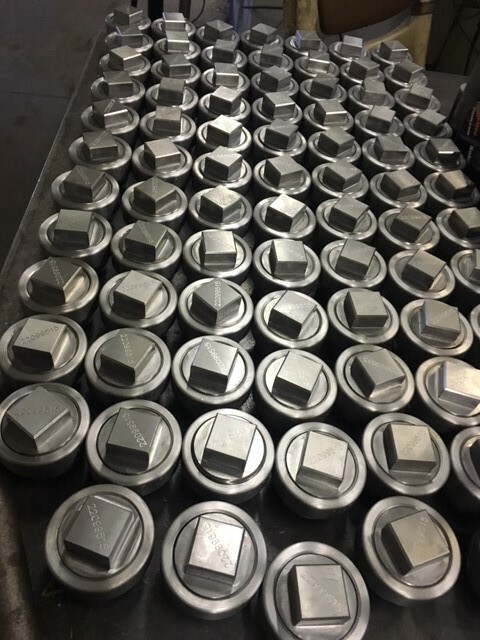 The accompanying bolts are currently in production. Photo courtesy SPEC Machine. Heat numbers are stamped onto C&NW 1385’s flexible staybolt caps. Photo courtesy SPEC Machine. Flexible staybolt cap and sleeve detail. Photo courtesy SPEC Machine. That number is vital because every piece of metal that goes into the pressure retaining portion of the boiler must meet very specific requirements of physical strength, mechanical properties and chemical properties and we have to be able to prove the materials we use meet those specs. 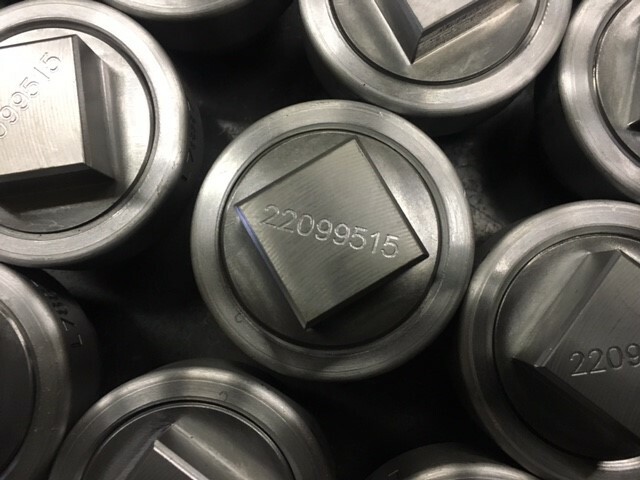 Every batch of steel made is tested for chemistry and physical properties and is assigned a unique number. 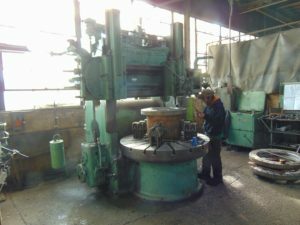 The records of those batches made for specific applications such as boiler plate follow the steel through the finishing process of the mill and each piece is marked with the heat number and other information. Those records are the certification that this particular batch or heat number meets this specific set of requirements and we must get a copy of and keep on file the material certifications or “certs” for short. That heat number represents the “pedigree” of each of those parts. 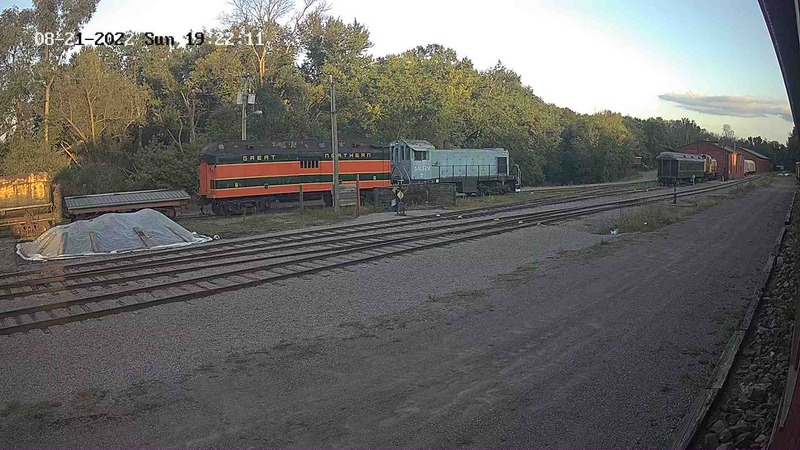 The below YouTube video produced by Wasatch Railroad Contractors while working on a different locomotive restoration provides a good illustration and explanation of how flexible staybolts work. Last but not least, SPEC Machine has also been busy finishing up more work on 1385’s brake equipment. Brand new brake heads were cast last summer (see post from Sept. 1, 2017) and are now being machined in preparation for installation. 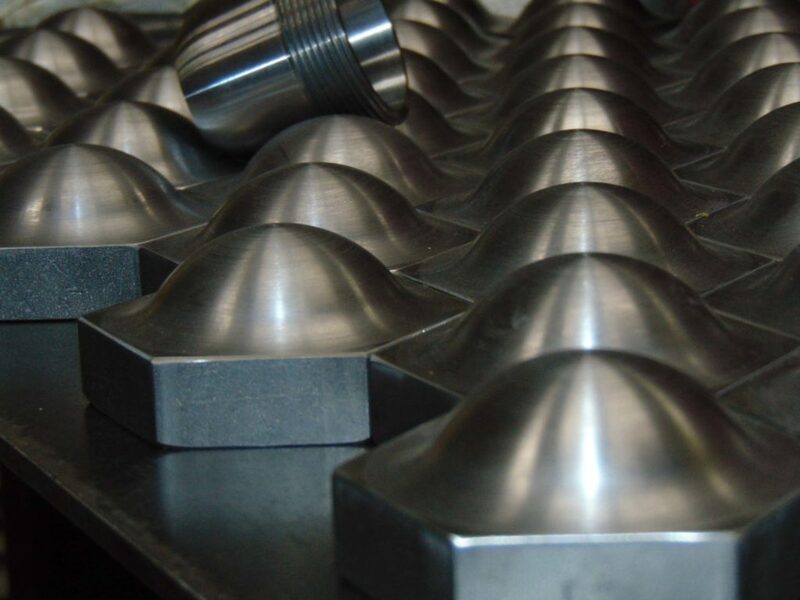 One of the newly cast brake heads is machined to specification. Each brake head supports one of 1385’s brake shoes. Bob Ristow devised a drilling guide to ensure alignment of the replacement staybolts in the crownsheet patch. 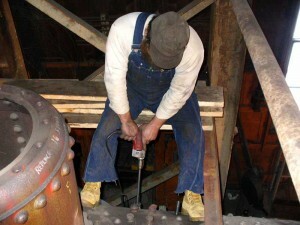 Here are a few pictures of Bob and Dave Lee drilling pilot holes for the staybolts. Drilling pilot holes for staybolts.